Gastrodiscus aegyptiacus is a parasitic fluke or parasitic worm belonging to the class of worms known as Trematodes. Adult Gastrodiscus are about 1.5cm, oval shaped with a flat body. The mouth is a muscular tube that allows sucking. As with most flukes, they are hermaphrodites and therefore have both male and female parts. The life cycle is incompletely described but horses act as a final host for these parasites. It has an indirect life cycle requiring freshwater snails- Planorbid snails- commonly known as Ramshorn Snails- primarily act as an intermediate host. The life cycle is complex and requires different stages. Eggs are shed by the adult flukes and expelled with the faeces. The miracidiae hatch from the eggs within a few days and swim in the water until they enter the snail. These larvae can survive for weeks without a host, provided there is enough humidity. Once inside the snail, development takes place and the larvae develop into cercariae. These then leave the snail and attach to surrounding vegetation where they produce metacercariae. The metacercariae appear almost black and are infective for the final host. 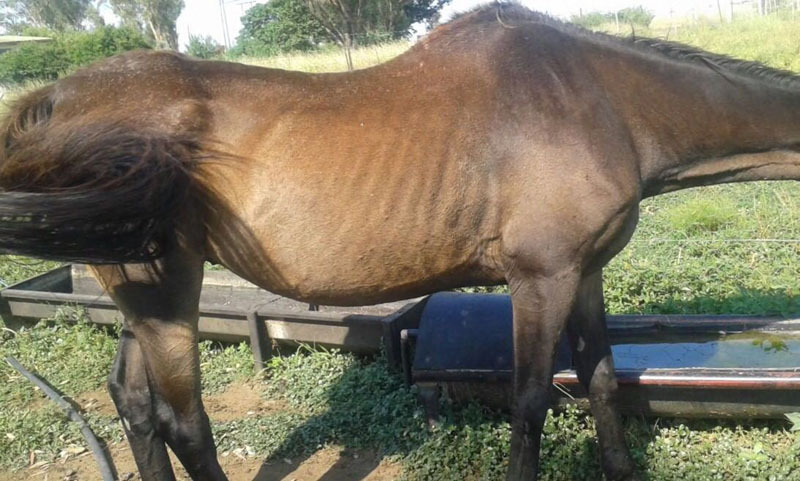 Horses usually become infected by grazing contaminated pastures. Once inside the host they make their way to their final destination where maturity is reached. The predilection site of Gastrodiscus in the horse is the caecum and colon. There are many reports of G aegyptiacus in the absence of clinical disease and it was originally considered non-pathogenic. Most infections are considered benign and show no clinical signs. Cases of recurrent colic, lethargy, diarrhoea, inappetance and weight loss have been described. There are many reports of Gastrodiscus aegyptiacus in the absence of clinical disease and it was originally considered non-pathogenic (disease causing). Most infections are considered benign and show no clinical signs. Cases of recurrent colic, lethargy, diarrhoea, inappetance and weight loss have however been described. The degree of clinical signs of infection may not be related to the level of parasite burden. 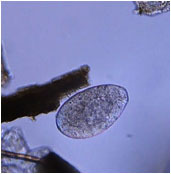 Diagnosis is done by the detection of eggs or immature flukes in the faeces. 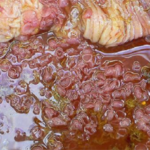 The current faecal sedimentation test does not give an indication as to the quantity of worms present in an individual and presently the gold standard to do so is through necropsy. Furthermore, because this test is used to detect worm eggs, a negative result will be obtained if the horse is infected with immature parasites. Adult flukes can be identified at necropsy. The lower limit of parasite numbers at which they can be detected during the test is also unknown. These are limitations to consider when interpreting the results. 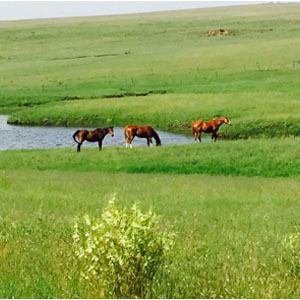 Clinical signs are usually accompanied by a history of grazing in marshy pastures although it is believed that horses may get infected by consuming contaminated hay. 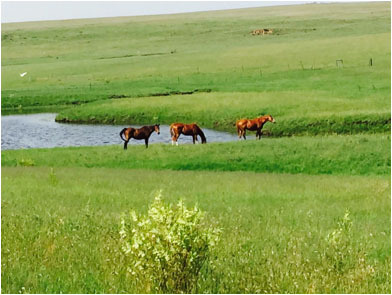 Keeping horses away from wet, marshy pastures or areas that are regularly flooded is considered the most important preventative measure. Dams and stagnant water should be fenced off and horses should be offered fresh, clean uncontaminated water. Since the snails that act as intermediate host are aquatic, and the miracidiae struggle to survive in a dry environment, measures of effective drainage to keep the pastures dry should be implemented to minimise the snail population. There are no registered products for the treatment of Gastrodiscus in horses and therefore the treatment with the drug Tramizan is “off label” i.e: not licensed or registered for equine use. Ruminant medication containing Oxyclozanide is used for treatment and in a therapeutic trial, treatment of positive horses with Oxyclozanide led to negative faecal sedimentation. Whether or not this product is effective against immature stages is still not known. The Oxyclozanide is combined with Levamisole in ruminant remedies. 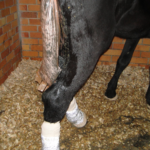 Levamisole has a low safety margin in horses and should therefore be used with caution and under the control and instruction from your Vet. Prophylactic (preventative) treatment for suspect infestation is not recommended due to limited understanding of the epidemiology, low incidence of disease and the absence of a registered worming product. For further information or any queries, please contact us at the clinic on 011 4683393 or on our emergency number 082 459 0129.